Chicago, IL - The academic year at Holy Resurrection Serbian Orthodox Cathedral in Chicago was festively opened on Sunday, September 9th, with the celebration of a Hierarchical Divine Liturgy and Invocation of the Holy Spirit – the “Spirit of Truth” and “Treasury of blessings” – upon the children, students, parents, teachers, and volunteers who participate in the Cathedral’s wide range of educational activities. 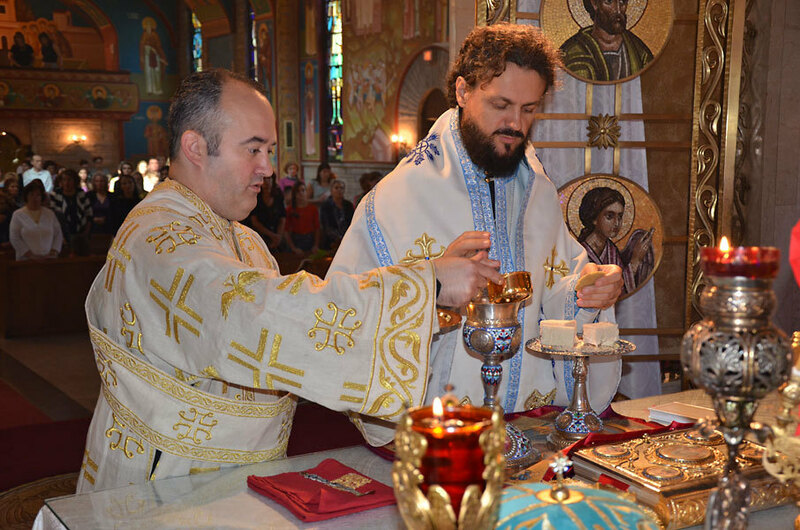 At the invitation of His Grace Bishop Longin of New Gracanica-Midwestern America, the Divine Hierarchical Liturgy and Service of Invocation of the Holy Spirit were celebrated by His Grace Bishop Maksim of Western America, with the concelebration of Rev. Darko Spasojevic, Cathedral Dean, Rev. Radovan Jakovljevic, Rev. Vasilije Vranic, and Rev. Dn. Todor Sokolovic. "In our Orthodox Church, we’re invited not only to repent, not only to give thanks, but also to partake, to commune, to eat from the wedding dinner of the Kingdom which is the resurrectional experience of Christ. We can make our efforts to live an ascetical or ethical life. But if we fail in partaking of the Dinner of the Kingdom in the Eucharist, we run the danger of loosing everything! ", said His Grace Bishop Maksim in his sermon. Following the Divine services, Cathedral parishioners and guests enjoyed the fellowship of friends and family at a community-wide picnic, and had the opportunity to learn about the Cathedral’s ministries and view an exhibition of Contemporary Serbian Iconography.